Before we use any power tools, let's take a moment to talk about shop safety. Be sure to read, understand, and follow all the safety rules that come with your power tools. Knowing how to use your power tools properly will greatly reduce the risk of personal injury. And remember this: there is no more important safety rule than to wear these — safety glasses. 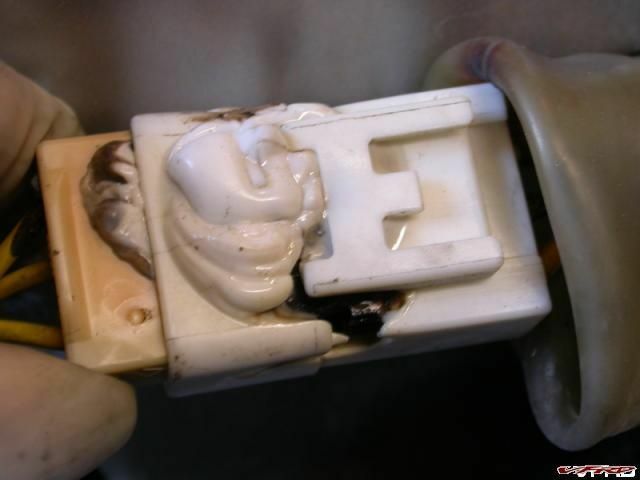 Totally melted white connector block. As far as level of difficulty goes this job rates just slightly harder than changing your oil - and only because a couple more tools are required. First, remove both left and right side panels then remove the radiator overflow bottle and hang it out of the way (no need to empty it). Next, undo the electrical connectors. I had a heck of a time trying to figure out how to get the sealed type connectors opened. There is only ONE tab (despite what I thought) and they can be a little troublesome to pull apart since the seals create a bit of suction. TRICK - You will also need to disconnect the stator to regulator/rectifier 3P connector on the right hand side. 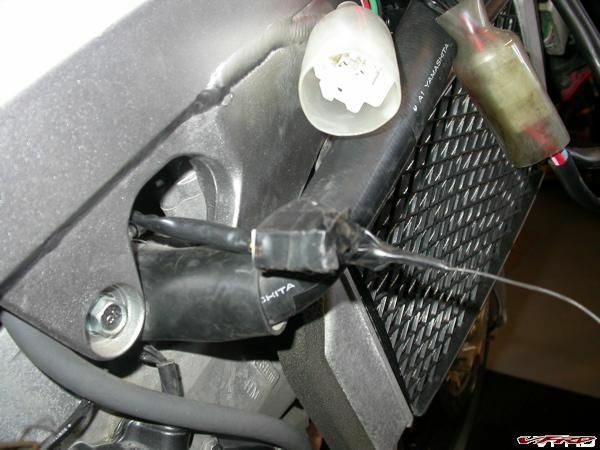 Once it is disconnect tape a string or wire securely to the end. This way when you pull the stator off the left side to the bike the string/wire will follow --- this will help you to pull the new stator wire back through the engine "V" later. With all the connector undone you can get to work on the left side case cover. 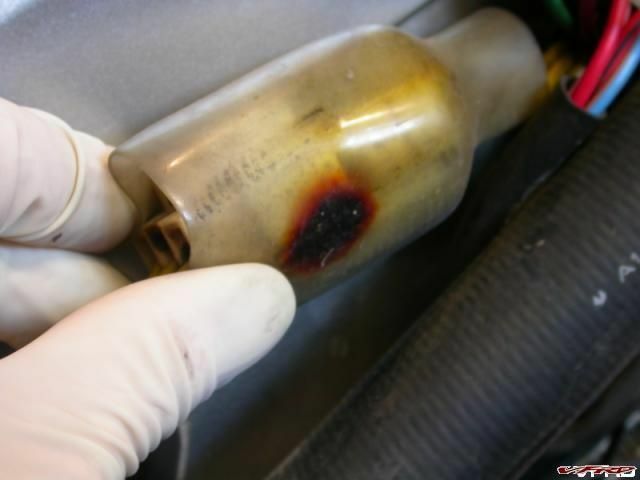 You'll want to put a rag down to catch any oil that spills out - I only lost about 1/4 cup and my engine oil level was still good at the end to this repair. With the bolts removed carefully pry the left side cover off. The magnets in the flywheel want to hold the cover on as does the gasket. I managed to find a couple of tabs that I could get the screwdriver behind and pry on - just go slowly and work the cover evenly off the aligning dowels. You shouldn't have any problems. 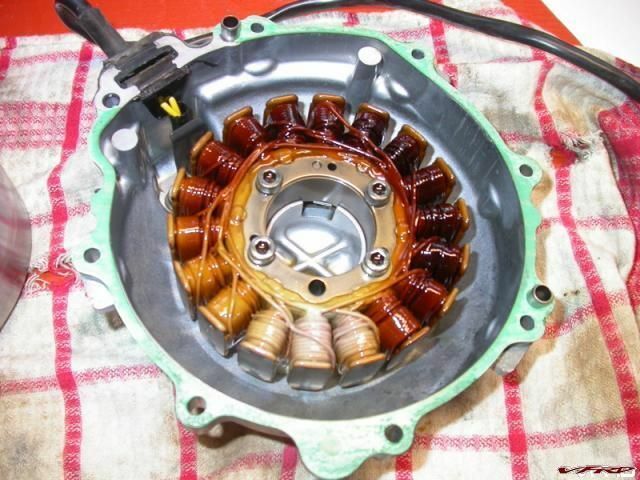 Remove the old stator, clean the old gasket material off the cover, replace the stator and torque to specs. TIP - Placing the rubber wire grommet into the cover was a bit of a stretch no matter how I tried. For a while I thought that the grommet was in the wrong place and too close to the stator. In the end I just worked the grommet into place as I tightened down the wire keeper and then tightend down the stator. If you are replacing the flywheel - read on. Remove the single bolt holding the flywheel in place. 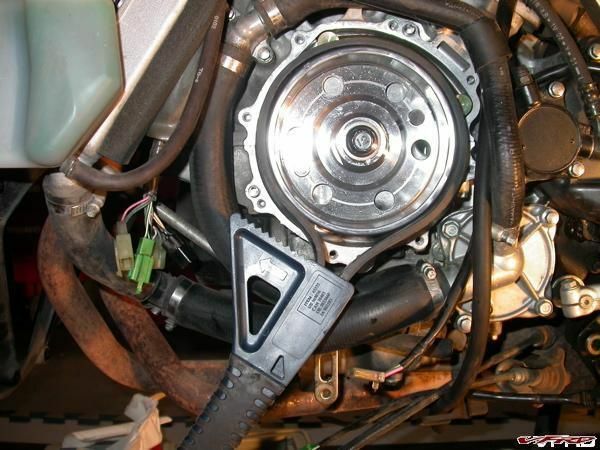 To do this you will need something to stop the flywheel from turning (engine compression won't do it). I used a cheap strap wrench. 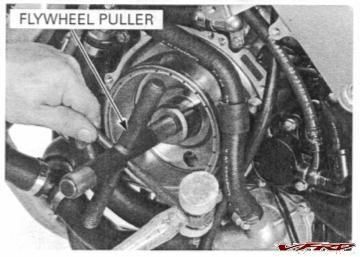 Next, Honda specifies a flywheel puller in the Service Manual. It is nothing more than a correctly threaded bolt with arms that can be hammered on. The "bolt" threads into the end of the flywheel and presses against the end of the tapered shaft that the flywheel sits on. 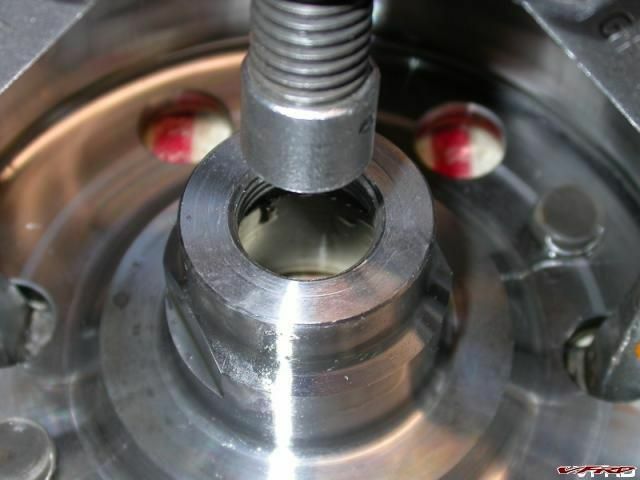 Hammering on the "bolt's arms" caused the bolt to push against the shaft and force the flywheel off the shaft. 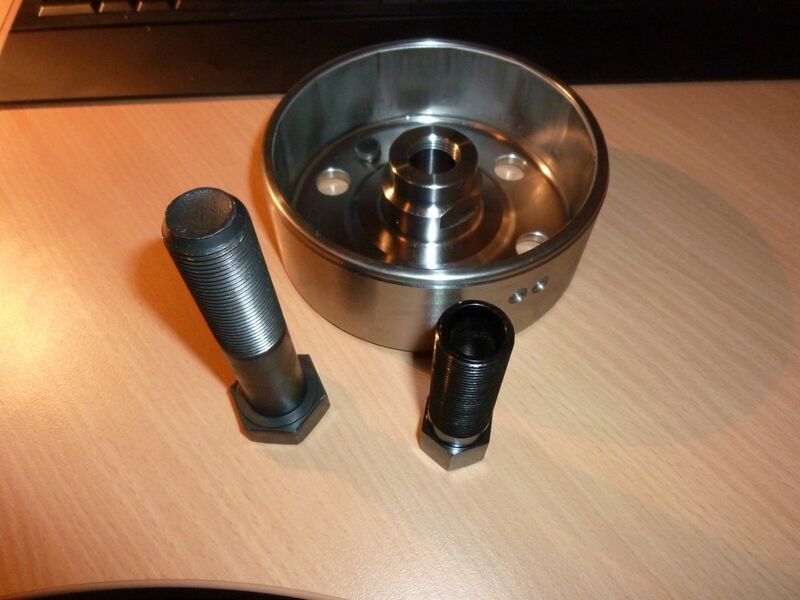 TIP - Bring your new flywheel into a machine shop and have your own "puller" built. TRICK - Service Honda lists the tool as a "PULLER DYNAMO" and sells it for $16.46 USD. My rental puller cost me $10 so it's probably worth the extra $6.50 to have the correct tool for the job - you can alway rent it out to your VFR buddies for a case of beer and you'll end up way ahead!! Here is a close-up. 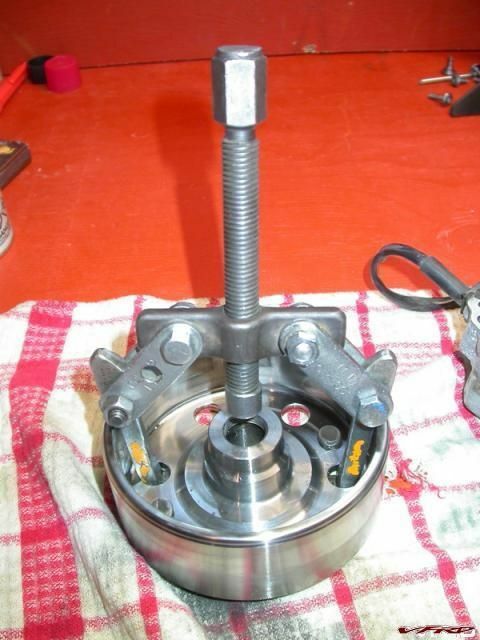 If you do use this method you will need a puller that can fit through the center of the flywheel and push against the end of the tapered shaft. The end on this puller was about 5/8" and fit through nicely without going inside the tapered shaft or damaging the threads on the flywheel (my flywheel will be replaced with the kit anyway but no sense doing a bunch of damage). Those holes in the flywheel are also quite small so you'll want very small arms on the puller. I had to place each arm into their respective holes and then reattach them to the body of the puller. Apply a thin film of oil to the tapered shaft then slide the new flywheel on and torque it into place using the flywheel wrench to keep it from spinning. There is no shear pin or key - it's just a friction fit. Now apply sealant to the specified locations (I gave a thin coat all the way around), place the gasket on the dowel pins, more sealant, then replace the cover with the new stator installed and torque to specs - tightening in a criss cross pattern. TIP - In this case the specs on the bolts aren't published in Chapter 17 of the Honda Service Manual. Instead look in Chapter 1 - General Information page 1-12 to find the "Standard Torque Values". TRICK - I read that someone cracked their cover by using the bolts to pull it into place. This is because the magnets in the flywheel want to pull everything out of alignment and the cover was not properly seated on the dowel pins. I used some rod to help align the stator cover. An even better solution would be to buy a couple of bolts about 2-4 inches longer than the cover bolts. Take those extra long bolts and cut the heads off and you'll have some aligning studs. Thread the studs in, place the cover on the studs and then slide the cover into place. Remove the aligning studs a "Bobs your Uncle". Once everything is torqued in place, pull your new stator wire back through the engine "V" using your string/wire (you may need to fiddle a bit with it). Then reconnect all the electrical plugs - might as well add some dielectric grease to them while your at it. 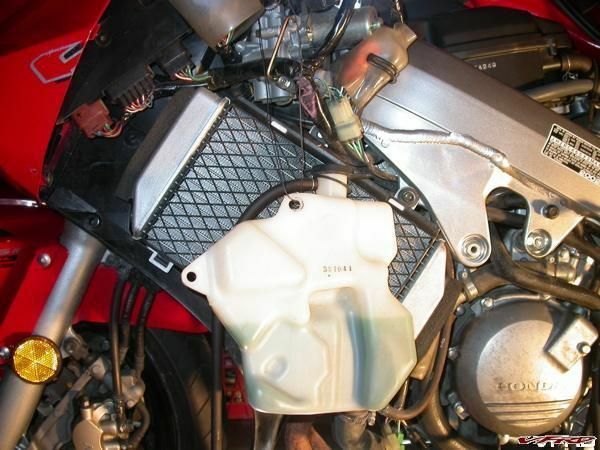 Replace the radiator overflow bottle and reattach your fairings. Check your oil and start her up. To get the full benefit of your the new alternator you should really upgrade the remainder of the charging system --- check out Electrical Upgrade - How To With Pics. The last thing I added was a voltmeter to monitor the situation. You can see it here at Lascar Voltmeter Install Pics. NOTE - most of the tips and tricks came from this website in various posts and references. Thanks for all your help. Great idea about the safety tip. I actually thought my reactions were quick enough to shut my eyes if anything headed towards them. A trip to the emergency room (actually twice) taught me I'm not as fast as I thought I was. BTW, ferrous materials will actually begin rusting in your eye before they get them out. Somedays we are as stupid as our wives/girl friends think we are. I did my stator, and I wanted to add to the alignment step. I purchased 4 6mm x 75mm bolts at Lowes for ~$7. I cut the heads off of them and then used them in every other whole to accomplish the alignment. It worked like a charm. Looks identical to my connector on the 04. I did away with the connector and all is well. Does anyone know what size thread the flywheel needs for a flywheel puller? There's a bucket of tools on eBay etc but none of them mention the 2002+ models and the thread size needed. Honda Australia is quoting me $122 for the tool which supposedly costs $16 in the USA. The best info I can find is that the thread might be M20 x 1.5 RH thread. A tool is available from Motion Pro in that size..
Wow mate, that was the most useful post, EVER! Anyway I took a punt and ordered the M20x1.5 RH tool as listed above. We'll find out soon enough if it works! My new flywheel arrived today, and I dropped down to the local bolt supply company since my flywheel puller bolt hasn't arrived yet. I can confirm that M20x1.5 RH thread is the correct bolt size for removing the flywheel on any 6th-gen VFRs. The guys only asked for a couple of bucks but I threw them $5 since I've managed to get a couple of free bolts off them in the past. Only problem is, now that my Shorai Lithium-phosphate battery has arrived my signal dynamics voltmeter is no longer complaining about low voltages at idle. It's even sitting above 12.5 volts with the engine off and all the accessories powered up (and headlights too). Just curious, why was the flywheel replaced?? Was it damaged somehow?? I didn't see any reason in the write-up. It's listed briefly in the first post - basically the 2002 model VFRs had a weak charging system that would flatten the battery when idling if the lights are on and the fan kicks in. And when the stator starts to wear out the problem only gets worse. Okay, thanks. I knew there were stator problems, but didn't realize the flywheel would "wear" and need to be replaced as well. Maybe it looses magnatism?? I don't think it actually touches the stator, does it?? No no, they don't wear - only the stator wears out (heat causes the insulation in the wires to break down). The main problem was that the stator and flywheel combination on the 2002 was so small that it could not charge the battery and run the lights when the bike was idling. In other words, it wasn't manly enough and the bike needed a bigger one! OK folks I have two flywheel puller bolts ready to go. One of them is solid, one hollow. Which one do you all think I should use? Will the solid one damage the hole for the flywheel retaining bolt on the end of the crankshaft? The hollow bolt by the way is the Motion Pro tool. Well I just did my flywheel and stator upgrade this evening, and it all went smoothly! I tell you, that strap wrench idea was fuggin' useless if you're a piss-weak nerd like me or don't have any friends handy. In the end, I removed the flywheel bolt using my airgun - BAP BAP BAP and off she came, just by putting the gearbox into sixth. 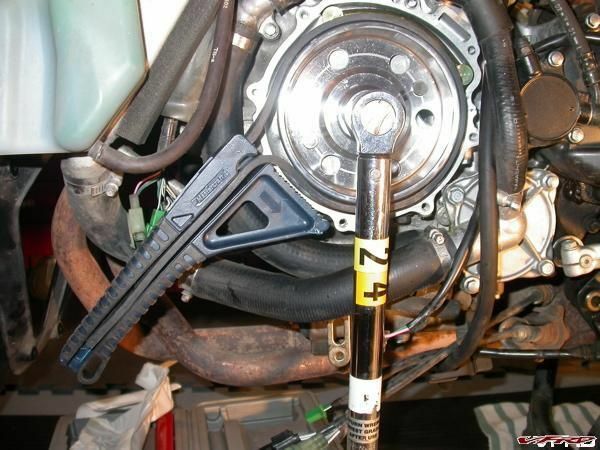 If you don't have an air ratchet, you really will need to either be a strong mutha, or have a mate put everything he has into holding that flywheel in place with the strap wrench. One thing I thought would be a nightmare (but ended up being a piece of piss) was getting the flywheel off the crank. I mean I stuck that Motion Pro bolt in there, turned it a couple of times and I was freaking out because it wasn't getting tight until I realised the flywheel had already come off the crank. Anyways, with the new flywheel and stator I'm getting 22 volts AC at idle (cold) whereas I was previously getting 18 with the OEM 2002 stator and flywheel. I will definitely recommend that anyone changing their stator have an impact screwdriver handy, because the bolts holding the stator to the engine cover are TIGHT and the screw heads (they'll either be torx or hex) are soft and will round out before you know it. 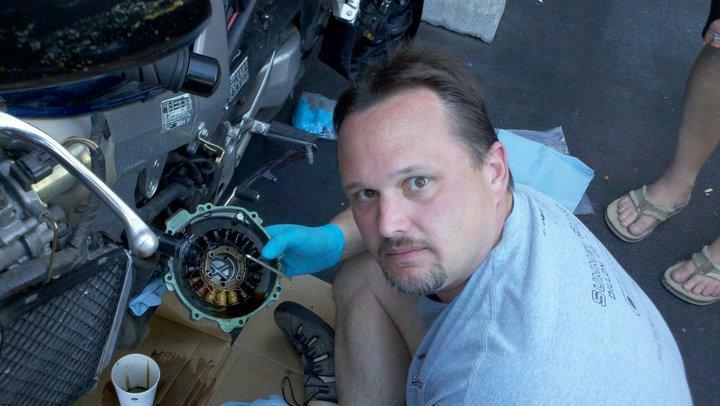 When my original 2002 stator died in 2010 (cooked itself), I couldn't get the bolts out and got so mad I attacked the entire stator with an angle grinder. It was good stress relief, but fugged up the stator alright. Gosh, is there anything left on this bike I *haven't* changed?! I wonder if the "upgraded" 2002+ stator and rotor would fit a 5th gen????? Probably. But I would first measure the 5th-gen unit because they might be the same size anyway. 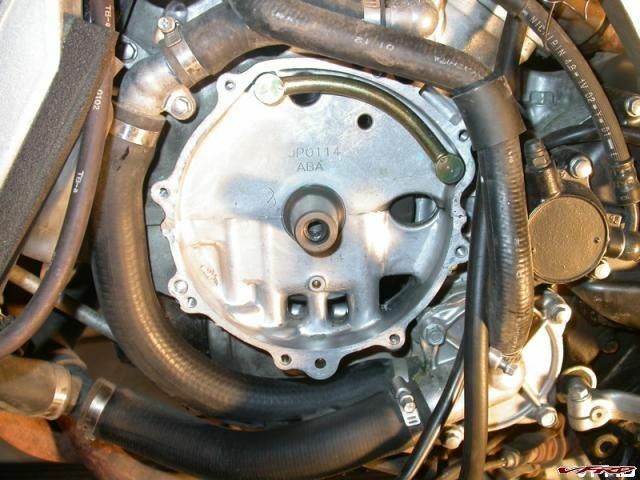 If you have or know the codes written on the stator and flywheel from a 5th-gen we can check it out. 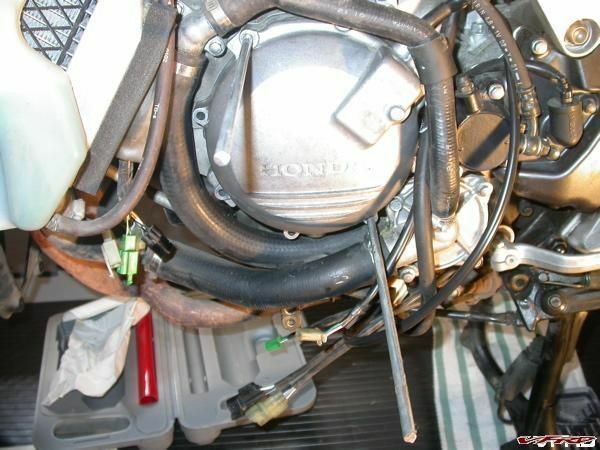 I'm not talking about the Honda code though, I'm talking about the code like "10CY" or similar written on each part. Check this out though - I see that Honda Parts house has the combined stator/flywheel upgrade kit ("AC Generator Set") for only $194! The part code is: 31100-MCW-315. A must for any 2002 owner, as I just paid $165 for the flywheel alone! Also, since changing the flywheel and stator I rode to work today in heavy traffic. Even when idling with the lights on and fan running, my voltages never dipped below 13.2. That's way better than the old charging system. Definitely a recommended upgrade for 2002 owners who commute in traffic (especially in hot climates). I'm at 14v with a Rick's stator and original rotor. 1. When wrapping a wire around the plug to pull through, be sure to wrap it in such a may that there are no sharp edges to catch. I did not do this on the first pull, and the plug seemed to catch every edge it could find and had to be coaxed through with a long screwdriver. On the second pull, I wrapped the plug with smooth electrical tape in the shape of a bullet. It pulled through effortlessly. 2. This tip is obvious for those with mechanical experience. I wished I used a chemical gasket remover because it is very easy to scratch the soft metal surface of the stator cover. I also removed the small bits of (silicone?) 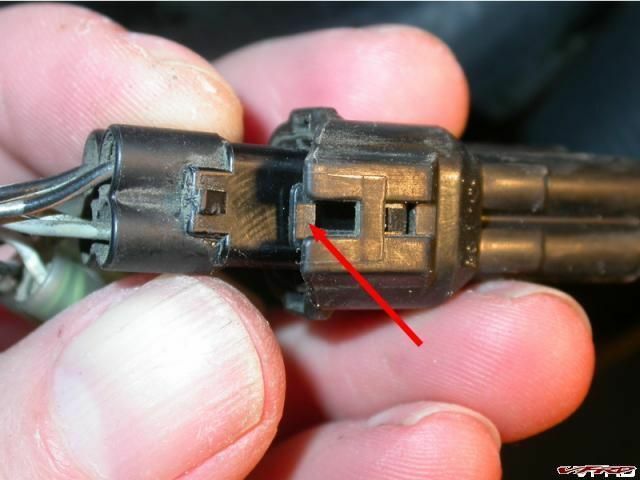 around the wire plug that were originally installed at the factory. Probably should not have done this. 06 should have an upgraded rotor. I just changed my stator and left the rotor in place. With new stator and some upgrades to the charging system (extra grounds, beefier charging wires and direct soldering instead of plug connectors, I get excellent charging at all RPMs with all of my lights, fan and heaters on high. Didn't do the flywheel, but I have fond memories of my RR and Stator-ectomy taking place in the parking lot of the BW in Eureka, CA. so rewarding to be riding with peeps who know what the heck they were doing. I'd offer this tid bit. . . . If you are experiencing even slight electrical blips, before you go much further than your local shop, order the parts & do it in the comfort of your own garage. 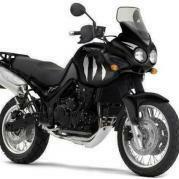 Another big shout out to tightwad for the site member source of where to get the parts www.wiremybike.com. Only the original 02 models, need a Rotor, all newer models already have the Newest flywheel/rotor. How many miles are on you 06 at stator failure? Can anyone advise if this model would need the rotor replaced as well as stator - obviously hope not as this would make job much easier. Also any idea of outer diameter for 2006 model - is it the 107mm or 115mm??? Rotors don't wear out, so no need to replace. 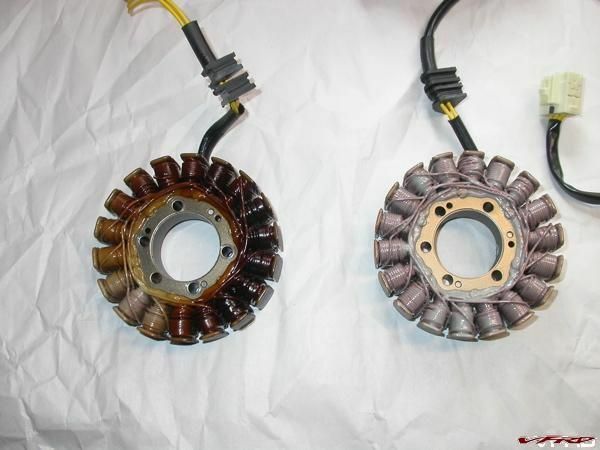 Outer diameter of original 2002 model stator is 107mm. Outer diameter of upgraded stator is 115mm. I have one of each in my garage just lyin' around.